Can Used Coffee Grounds Be Used in Flower Beds? How Can I Keep Dogs Out of My Flower Beds? Coneflower, also called echinacea, has long stems with lavender flowers. The petals pull down from the red-orange, cone shaped center. This attractive perennial is striking in borders and beds. Pruning throughout the growing season helps encourage healthy blooming. Pruning early in the season before they have a chance to bloom gives you shorter plants that bloom a little later in the spring. Because coneflowers have long stems, an early prune ensures they fit into your borders and beds without blocking the flowers behind them. Cut coneflower stems down to 6 inches in height once the first flower buds begin forming in spring. This is only necessary if you prefer shorter flowers for your beds. 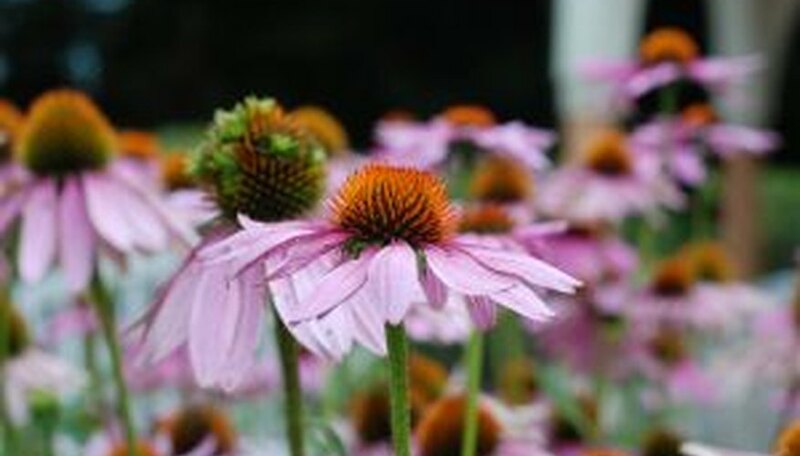 Inspect coneflowers weekly once they begin to bloom for areas that need to be pruned. Remove withered flowers before seeds form. Snip off the flower head a quarter inch above the nearest flower bud on the stem. This encourages further blooms because the flower strives to produce more seeds. Look for seed heads that have already formed. Remove them from the plant by cutting them off above the nearest bud. Remove stems entirely once all blooms have blossomed and withered. Cut off the stem even with the soil surface. 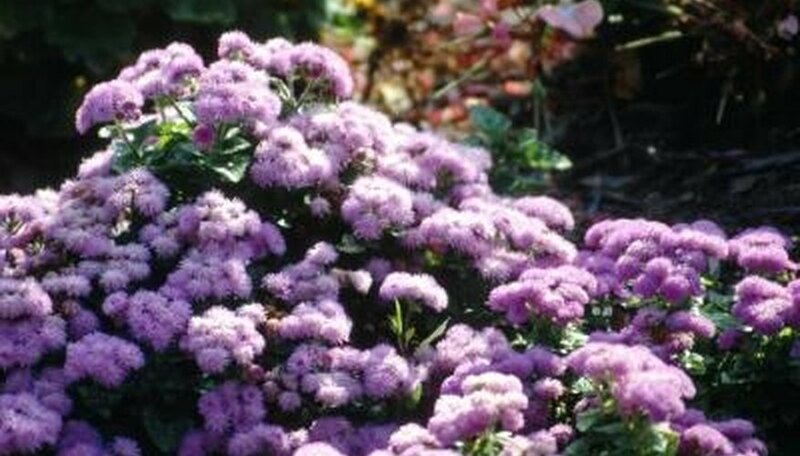 Plant ageratum in bright sunlight or partial shade, depending on your climate. Although ageratum blooms best with plenty of sunlight, ageratum benefits from afternoon shade in climates with hot, dry summers. Water ageratum deeply enough to saturate the roots when the top of the soil feels slightly dry. Don't allow the soil to remain soggy, but water often enough that it doesn't dry completely. A 1- to 2-inch layer of mulch such as bark chips or dry grass clippings keeps the soil moist and saves water. Fertilize ageratum after planting time in spring. Use a general-purpose, time-release fertilizer applied according to the rate recommendations on the package. One feeding is enough to provide nourishment for ageratum throughout the growing season. Pinch off wilted ageratum blooms, as deadheading keeps ageratum blooming until the first frost in autumn. Remove the blooms as soon as they wilt and don't give ageratum an opportunity to go to seed by waiting until the flowers are completely dry. Coffee grounds can be sprinkled about flower beds as a feed, worked into the soil as an additive, or used as mulch around flowers. It adds nitrogen to the flower beds, working like a fertilizer. Measure the dimensions of your flower bed. For example, a nice-sized flower bed near a home measures about 3 feet wide by 8 feet long. Place a solar-powered light disc at each corner of your flower bed. Solar-powered light discs can be obtained at any outdoor and garden supply store. Place a light disc into the soil around the edges of the flower bed every 2 feet. This creates enough light to softly illuminate the flowers in the bed without flooding the area with light. Solar-powered lights do not require any electricity to operate, making them an excellent choice for flower bed lighting. The only foolproof way to keep dogs out of flower beds is to install a fence around the border of the garden. Commercial deterrents may work for short periods. 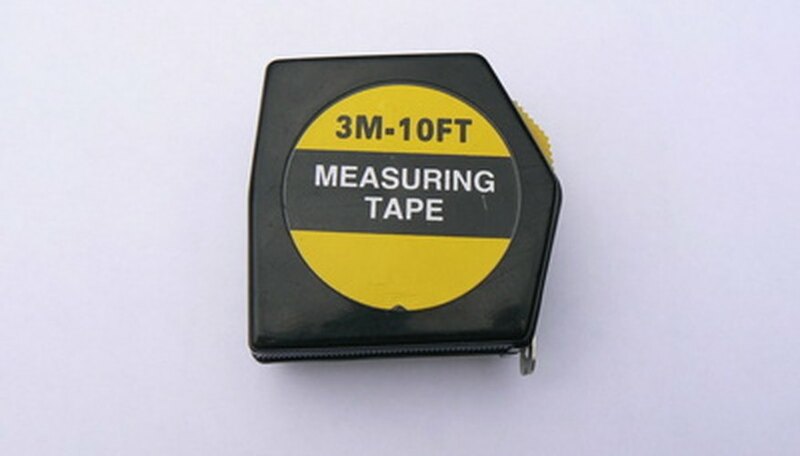 Measure the dimensions of your flower bed with a tape measure. This allows you to know the amount of gravel to fill in the area. Surround your established flowers with 1-inch-deep layer of colored gravel. Select a color that enhances the current color variations of your flower bed. Place a small cobblestone slab between widely spaced flowers. 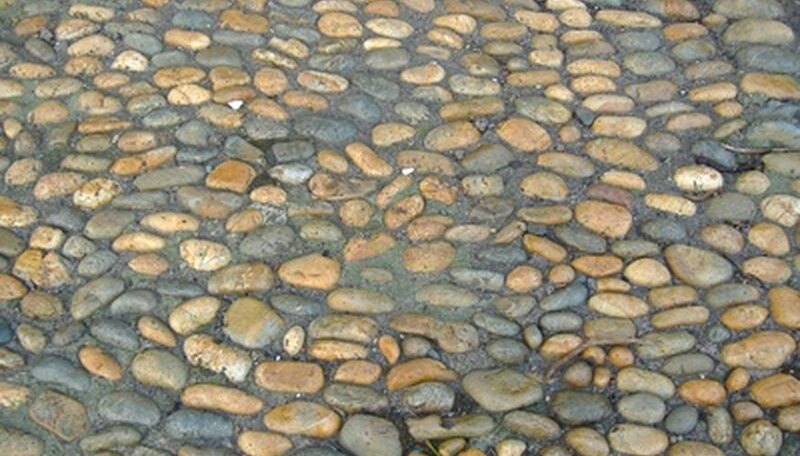 Two or three cobblestones in a flower bed look natural and serve as platforms on which figurines can sit. Place attractive garden figurines on the cobblestones. Gnomes, fairies and garden frog statues look beautiful in a flower bed. Choose a location for the paperwhites outdoors. Inspect the location for full sun and well-drained soil. Both are essential to the health of paperwhites. Dig a hole with a hand shovel 5 to 6 inches deep and 2 inches wide. The bulb of the transplanted flower should fit securely into the hole without causing damage to the root system. Remove the paperwhite from its existing container, paying careful attention not to damage the roots. Place the bulb into the hole and firm the soil around the plant's base. Repeat for additional transplants, placing four to five paper whites per square foot. Water well, moistening the soil. Apply a perennial fertilizer according to the label direction when transplanting. Apply the fertilizer again in the fall to encourage spring blooms. Position your flower bed in a place that gets full sun. Flowers need at least 8 hours of sun per day to produce lots of blooms. Mark the borders. Pound a small stake into each corner of the bed and run a string from stake to stake. If your flower bed has curved edges, mark them by laying a hose on the ground or by painting the borderline with spray paint. Prepare the soil. Loosen the soil by tilling or turning it over with a garden shovel. Dig down the depth of the shovel. Break up any large clumps of soil and remove any large rocks. Pull and remove all vegetation. Add soil amendments. Add at least 2 inches of compost to the surface of the flower bed. Add 2 to 4 inches of peat moss. Apply slow-release granulated fertilizer specially formulated for flowers to the soil’s surface, following the manufacturer’s instructions. Incorporate the amendments into the soil by rototilling again or by turning over the soil with the shovel. Rake the flower bed smooth with a garden rake. It is now ready to be planted. Remove all grass and weeds from your flower bed, making sure all the roots are removed. This is important to keep pesky grass from showing up again. Create the shape you want to around your flower bed by using your garden hose to draw the outline. Complement your flower bed with curvy, kidney-shaped or straight lines--whichever you prefer. A garden hose is not necessary; you can do this freehand if you like. Dig vertically 6 inches into the ground using a half-moon edging tool or a square spade, following the line of your hose. Take caution to avoid puncturing the hose. Create angled cuts at 45 degrees from the inside of the flower bed to meet the vertical cut in the ground, creating a trench that should be about 4 inches wide. Remove the excess soil from the trench and reinstate it back into the flower bed, provided it is free of any weeds or grass. Recut your trench each year in the spring to maintain its clean edge. Trim the bordering grass by hand if possible. Edge the flower bed so that it is separate from the the lawn. Use a garden hose to mark the line where you want the garden bed to be. Dig along that line with a sharp spade shovel or sod cutter. Remove the grass in the designated flower bed using a sod cutter or straight-edged shovel. Moisten the soil and the cut the grass into 3-foot long strips. Pry up the strips of grass in the flower bed with the shovel. Loosen the soil with the shovel when the grass has been removed. Mix in organic material such as compost, dead leaves, peat moss or manure 6 inches into the soil. Continue managing the flower bed by growing any seeds you’d like. If small patches of grass appear in areas of the flower bed, uproot them by hand or use a sod cutter. Apply a herbicide to the grass if it continues to grow in large amounts. A beneficial herbicide for grass is Preen. It will permanently kill the grass. Mark off where the flower bed will be, using a garden hose or powdered chalk to delineate the area. Remove any sod, weeds or debris and discard. Spread 2 to 3 inches of compost or manure on the soil and till it to a depth of 8 inches. Rake the soil to smooth and level it. Adding compost or manure improves drainage and soil texture and is especially helpful if you are planting a lot of perennial and annual flowers. Amending the soil may not be necessary if you are planting a few shrubs. Install any edging material, such as metal or stone edging. Lay landscaping fabric over the soil, cutting it to fit the flower bed. Secure it with landscaping pins, spaced 18 inches apart around the perimeter of the flower bed. Cut holes in the landscaping fabric to plant flowers or shrubs. Dig out the soil and place it on the landscaping fabric as you plant the flowers. Move the soil back into the hole once the plants are in place and firm the soil down gently around them. Plant shrubs or trees first and cut slits in the landscaping fabric to fit over the plants. 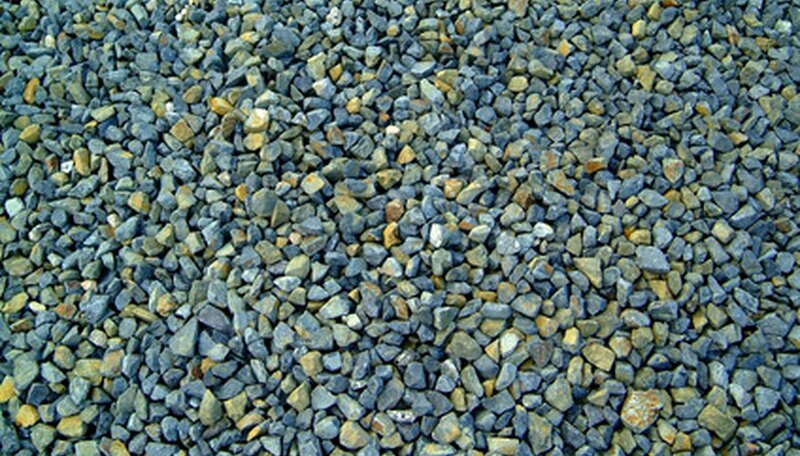 Cover the landscaping fabric with 2 to 3 inches of gravel. Rake it smooth. Water your flower garden. It is easier to pull weeds out of wet soil. Pull up as much of the grass and its roots as possible, but take care not to disturb your flowers' root systems. Certain annual types of grassy weeds may be controlled by pulling alone. Spray the grass with a selective post-emergent herbicide prescribed for use on the type of grass that is growing in your flower garden. Spraying can be done instead of pulling, or in case the grass comes back after it is pulled. Spray on a day when there is no wind (and no rain forecast for the next 48 hours) to minimize the possibility that you will accidentally spray your plants. Respray the grass at the interval dictated by the herbicide's manufacturer. New patches of grass may die after the first spray, but older stands of grass may need to be sprayed two to three times before they die. Remove the dead grass from your flower garden. Pick the grass. It's hard work but it's still the most efficient. Get down on your hands and knees with a spade and remove all the grass in the flower bed. Remove the roots to keep the grass from growing back. Use an herbicide. This is a quick and easy fix when it comes to grass in your flower bed. Just point the bottle and spray at the grass. Rent a sod cutter. It's best to use this machine in a large area to avoid taking out the flowers along with the grass. Know how to use the machine properly to avoid injury. Add mulch. Organic mulch is best for your flower bed but synthetic will work also. Remove as much grass as possible first then add the mulch. Start early. Remove the grass early in the season before it develops a root system. If you get to it early enough you might not have to worry about it the entire summer. Design the flower bed on paper before you begin the installation. Note the bloom time and height of the flowers to help you plan their placement. Adjust the style of the flower bed to complement the architecture of your home. If you live in a colonial home, a breezy cottage garden seems out of place. Remove the sod with a sharp spade or a gas-powered sod cutter. Pile the sod upside down in the compost pile to return to the flower bed after decomposition. Prepare the soil with ample amounts of compost or aged manure. You can till this humus in, or let earthworms do the work over the course of the growing season. Choose flowers that provide a succession of blooms. Add foliage plants and mix plants with different blooming times to avoid the appearance of a dead zone in the flower bed. Consider the mature size of the flowers before you give them a permanent position in your flower bed. Follow the spacing recommendation on the plant tag, even if it seems impossible that the plant could ever grow that big. Fill in temporary gaps with annuals. Plant large drifts of the same flower specimen rather than many different flowers. 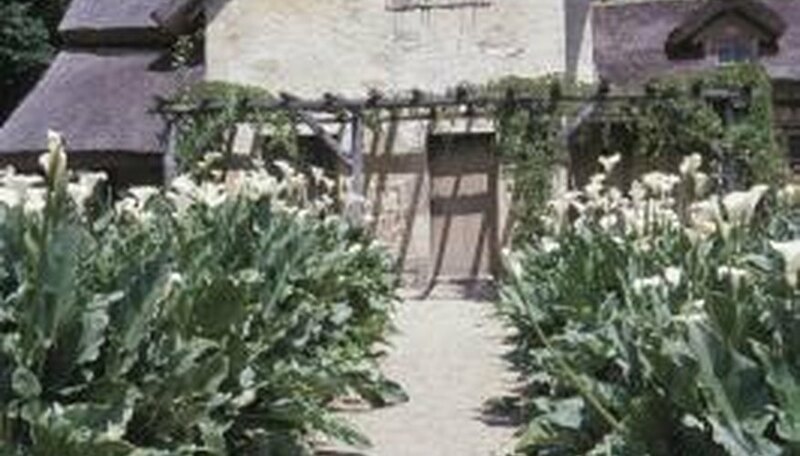 Odd numbers of three or five plants provide a repetitive look that is pleasing to the eye.